The internet is full of wonderful places. We have compiled a list of most useful, incredible and unique websites you probably have not heard of. 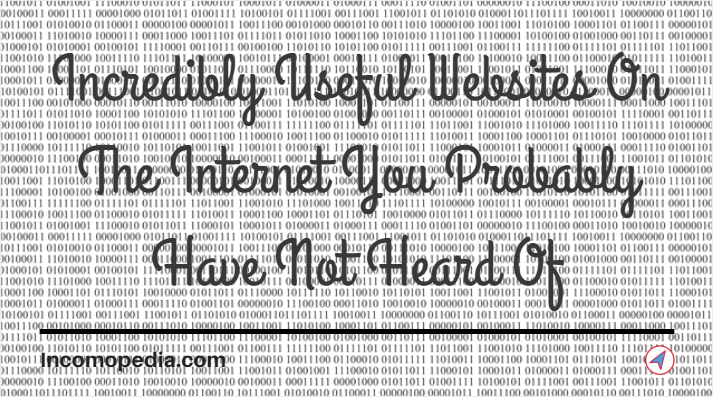 I am sure you are going to bookmark some of these lesser known but incredibly useful websites. Some websites will help you to be effective and productive, some will make you say WOW and for others, you will say ‘I Wish I Knew These Earlier’. 1. FlightRadar24.com – An amazing web-based flight tracker. You can even check flight tracks, origins, destinations, aircraft types, positions, altitudes, flight numbers, headings and speeds of flights in real time. It’s really stunning. 2. PostImages.org – If you work on micro jobs websites, you probably have used this website to upload screenshots. This is very light and fast image hosting website where you can upload photos/screenshot and get a link to share that with anyone you want to. Imgur.com and Tinypic.com are alternatives. 3. 10MinuteMail.com – As soon as you land on the homepage, you see a disposable email address specially created for you which you can use for 10 minutes. This might help you when you do not want to share your private email or beat spam. Crazymailing.com is an alternative. 4. JPEG-Optimizer.com – We can get dimensions of images right with MsPaint but it might be very difficult to change file size. You can use free online tool jpeg-optimizer in that case which will help you to reduce file size keeping the quality almost same. 5. En.Akinator.com – A fun but very accurate website actually. You have to think of a real or fictional character in your mind. The website will ask a few simple questions you have to answer and then it tells who were you thinking of in your mind. 6. Canva.com – Canva is very popular free online graphic design tool where you can design business cards, logos, Banners, Menu etc using drag and drop features and inbuilt layouts. Bloggers often use it to create images for their posts. 7. IsItDownRightNow.com – If a website is not loading, there might be some problem with you device, browser etc. Just write the name of the website on isitdownrightnow.com and hit enter to check if a website is down for you only or it’s the same for everyone else. 8. TwoFoods.com – Enter any two foods and it will compare both on the basis of calories, carbs, fat and protein and you will know what to eat. 9. Mathway.com – Mathway can be very useful website for both student and teachers. They provide amazing tools for students to help them understanding and solving the maths problems. Trigonometry, calculus, graphing, finite math, algebra and statistics are some of the areas they cover. 10. SmallPDF.com – Smallpdf.com is very useful website. It allows editing pdf, merging pdf, splitting pdf, converting pdf in different formats like pptx and converting different formats file to pdf. It’s free twice an hour. Zamzar.com and pdfEscape.com are incredible alternatives. 11. Typing.com – Typing.com is a great website for learning touch typing. Improve your typing skills by playing typing games and typing tests. TypingClub.com is similar website you can try. 12. RainyMood.com – Land on the website and you will feel like it’s raining outside. MyNoise.net is another similar useful website. 13. JustDeleteMe.xyz – Sometimes you want to delete your account from a popular website and you don’t find that “Delete” button you can click on. There are chances you will find that delete button on justdeleteme.xyz. It’s a directory of direct deletion links of popular websites such as facebook, twitter etc. You can permanently delete your account from different web services. 15. Trends.Google.com – Google trends shows what people are looking for or what stories are trending. How can it be useful? If you are blogger or writer, you can get ideas what to write. You can see popular search queries on Google Trends. 16. Homestyler.com – Homestyler is an amazing room layout website where you can design your office or room. You can try different furniture placements virtually and use your space very effectively in real. 17. CoolThings.com – World is full of amazing things. Cool products, cool car stuff, cool news stories or cool whatever, you get all awesome things to read about on coolthings.com . 18. HowManyPeopleAreInSpaceRightNow.com – Pretty self-explanatory. It tells how many people are in space right now with name, country and no. of days in space. 19. GeoGuessr.com – The website will show you a random picture from google earth and you have to guess where the place is in the world by clicking on world map. The website then tells you the right answer and how far the place is actually from where you marked on the map. 20. AirPano.com – Hope you would enjoy the virtual tour of world’s most amazing places. They have a vast collection of High-resolution 360° panoramas and videos of incredible places on the planet. Other similar and useful website is 360cities.net . 21. Radio.Garden – When you open this website, an interactive world map with a lot of green dots all over it is shown. Green dots represent live radio stations. Click on any green dot on the map and radio will start playing. 22. Numbeo.com – If you planning to move to another city, this website might be very useful for you. Just enter the names of any two cities and you can see the difference in markets, transportation, rent per month, childcare, utilities, foods and a lot more between the two cities. You can also compare traffic, quality of life, property prices, pollution, crime between any 2 cities. 23. Gutenberg.org – Gutenberg.org is a collection of 56000+ free and popular ebooks. No registration, no any fee. Read online or download them. 24. Duolingo.com – Duolingo helps you learn some of the world’s most popular languages like French, Irish, German, Italian, Dutch for free in very effective and fun way. Memrise.com is another good website to get the same thing done. 25. SuperCook.com – Just select what ingredients you have at home and supercook will search and show you all the recipes you can make with those available ingredients. You can also try out MyFridgeFood.com . 26. RulesOfThumb.org – “If the moon is full, it will rise at the same time that the sun is setting.” “Most people wear 20% of their wardrobe 80% of the time.” Want to read more rules of thumb? Rulesofthumb.org is there for you. 28. KhanAcademy.org – If you want to learn something outside the class, you might find khanacademy.org very useful. They offer free courses, videos, practice exercises etc so that learners can study in their own time. 29. CommonSenseMedia.org – Some people prefer IMDB Parents guide while other Common Sense Media. Both fulfill the same purpose. If you are a parent and want to check whether a movie has appropriate content or not for your child then you should check ratings on common sense media. They rate movies on various aspects like consumerism, violence, educational value, age appropriateness, language etc. 30. UMarkOnline.com – You put a lot of efforts in making images so they need to be protected. Umarkonline.com helps you to add watermark to images and let you control transparency, placement of watermark etc for free. You can also download their software for PC. 31. Unfurlr.com – Check where a short URL would take you to. Simple and useful website to check original link hidden behind short URL. 32. IconFinder.com – Browse 2350000+ SVG icons, perhaps the largest collection of free and paid icons on the internet. 33. PrintWhatYouLike.com – Very interesting as well as useful website. Just enter the URL of a webpage and print whatever part you want to print without junk stuff on the page. You can also save desired part of a webpage in PDF or HTML format. 34. OnlineOCR.net – This website lets you convert scanned PDF to word. You can also extract text from images and output file will be editable. 35. GTmetrix.com – If you have a website, you probably have used this website to analyze the speed of your website. It analyze the loading speed of the website and suggests you the solutions to make it faster. Google Pagespeed and Pingdom.com are great alternatives. 36. Ted.com – Ted.com have Motivational talks videos with powerful messages covering almost all topics can help you rediscover your life. Checkout TheDoLectures.com for more inspiring talks. 37. Vocabulary.com – As its name suggests, vocabulary.com is a systematic and fun way to improve English vocab. It explains words like you are learning from your favorite teacher. 38. TodayIFoundOut.com – Learn something new every day. TodayIFoundOut.com provides well researched ‘interesting facts’ articles. Don’t know what to read. Click on Green Surprise Me button. TheFactSite.com and Facts.net are other popular sites in this category. 39. PowerSearchingWithGoogle.com – We use Google a lot. If you learn just one thing(how to find things fast and effectively on google), it will alone save you a lot of time in life. Improve your Google search skills with powersearchingwithgoogle.com . 40. Lumosity.com – This website lets you engage in brain games designed by neuroscientist to improve your core cognitive abilities. 41. StackExchange.com – Stack Exchange is a big network of 133 Question and Answer communities such as stack overflow and superuser.com . Reddit.com and Quora.com are other two big Q&A sites. Get all your queries answered. 42. WolframAlpha.com – This is absolutely incredible and mind blowing website. Type in any question and you get your answer. I have tried that. The motto of this website is to make all systematic knowledge computable. 43. Instructables.com – Instructables is a Do-It-Yourself website where you find step by step instructions about making anything and Anything can be anything including a bag or a school project or a boat, mostly homemade creative stuff. Makezine.com and DoItYourself.com are other two great places to look for home improvement and repair ideas. 44. KickStarter.com – If you have a great idea in your mind but you don’t have enough support and resources(like money) to turn your idea into reality then Kickstarter is for you. Post your project on Kickstarter and interested people will help you bring your project to life. Indiegogo is another popular crowdfunding website. 45. Gifs.com – Animated GIFs are taking over. It is very easy to make animated GIF from any youtube video using Gifs.com . Enter URL of the youtube video and start making Gif with a lot of customization options. 46. Whois.com – Find out some important details about any website/domain name such as registrant name, address and phone numbers. Another similar and useful website is Who.is . This is not the end. We will keep adding useful websites to this list. If you ever visited a website which you think is really unique and helpful, please let us know via comments. Hi Sudhir, thanks for sharing such an amazing list of useful websites here. really an useful post. Thanks for sharing this useful list with us.